EU Referendum: Definitely not "us"
"Europe is not 'them', it is 'us'," says Barroso this morning in Berlin. The problem is, paleface, any "us" which includes the likes of the commission president is definitely "them". 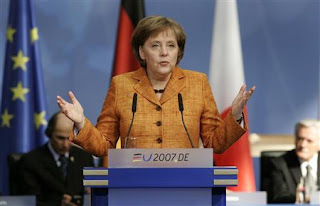 And it was "them", German chancellor Angela Merkel, representing the council, Portuguese former prime minister Barroso for the commission and the president of the EU parliament, German MEP Hans-Gert Poettering, who signed the Berlin Declaration - ostensibly in the name of the peoples of the European Union member states. How do these people have the nerve to present themselves as speaking for us, any of us? How can this woman, a leader of a different country, possibly speak for me? In the meantime, a car was set on fire in the Kreuzberg-Friedrichshain district of Berlin in what police said appeared to be a politically motivated protest against the EU. In the city centre, while what were described as "vandals" set fire to an information booth on "Europe". It is not much, but it's a start.